Barbara Nissman Interview with Bruce Duffie . 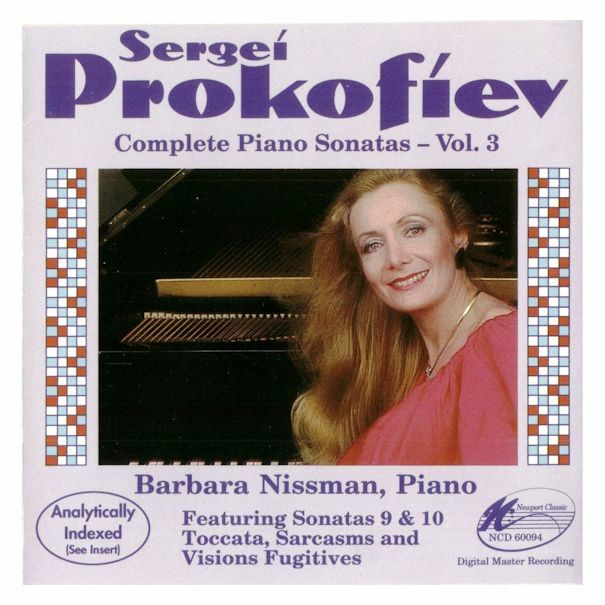 . . . . . . . .
Barbara Nissman is best known for her performances of the piano music of Sergey Prokofiev and Alberto Ginastera. 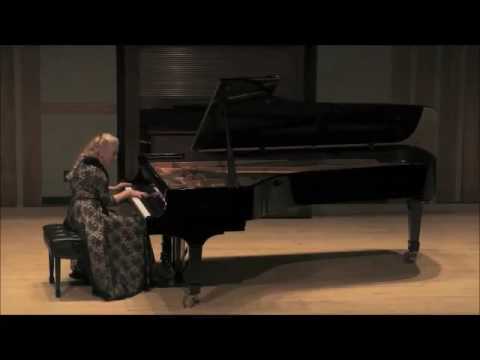 She has written extensively about Prokofiev's works, conducted master classes and given lectures on them, and in 1989, was the first to perform a complete cycle of the sonatas in a three-recital series in both New York and London. 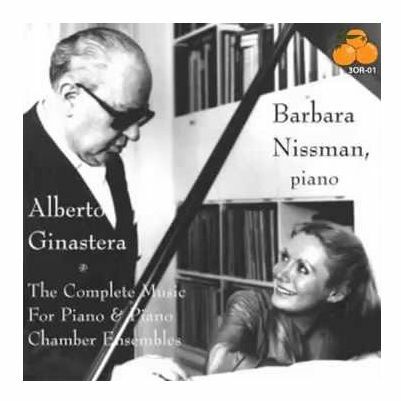 Nissman has also lavished attention on Ginastera, who dedicated his final work, the Third Piano Sonata, to her. Nissman has also performed works by Liszt, Rachmaninov, Bartók, Beethoven, Brahms, Mozart, and many others. She has concertized throughout the Americas, Europe, Asia, and New Zealand, and appeared as soloist with the major orchestras of New York, Philadelphia, Chicago, Cleveland, with many leading European orchestras, and with several major conductors, including Ormandy, Muti, Skrowaczewski, and Slatkin. Nissman was host of a 16-week BBC television series entitled Barbara and Friends, which also appeared on American public television stations. She has made numerous recordings, most of them originally issued on the Pierian label and reissued on Nissman’s own label, Three Oranges Recordings. Born in Philadelphia, PA, on December 31, 1944, she studied music at the University of Michigan and with György Sándor. 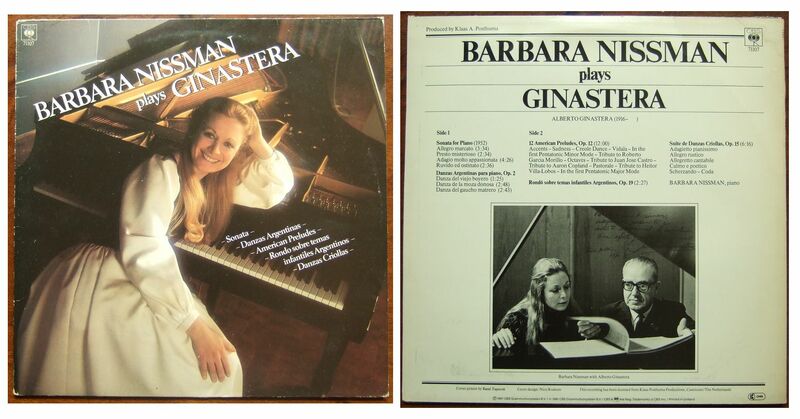 Nissman met Ginastera in 1971 when she was performing his First Piano Concerto at UM's contemporary music festival. That year she also went on a Eugene Ormandy-sponsored concert tour of Europe, and then debuted with the Philadelphia Orchestra under Thor Johnson in Ann Arbor, MI, with the Rachmaninov Paganini Rhapsody. She then appeared with Ormandy and toured with the Orchestra the following season. In 1976, at the invitation of Ginastera, Nissman performed his First Piano Concerto with L'orchestre de la Suisse Romande at his 60th birthday celebrations in Geneva. She would soon turn to Prokofiev, a composer whose music she knew from her student years. From the 1980s, she has been among his most ardent advocates. In 1988 she recorded all the sonatas and other piano works for Newport Classic, which issued the recordings in 1989 to general acclaim. During the 1991-1992 season, in celebration of the 100th anniversary of Prokofiev's birth, Nissman again performed cycles of the composer's sonatas throughout the U.S. and Europe. 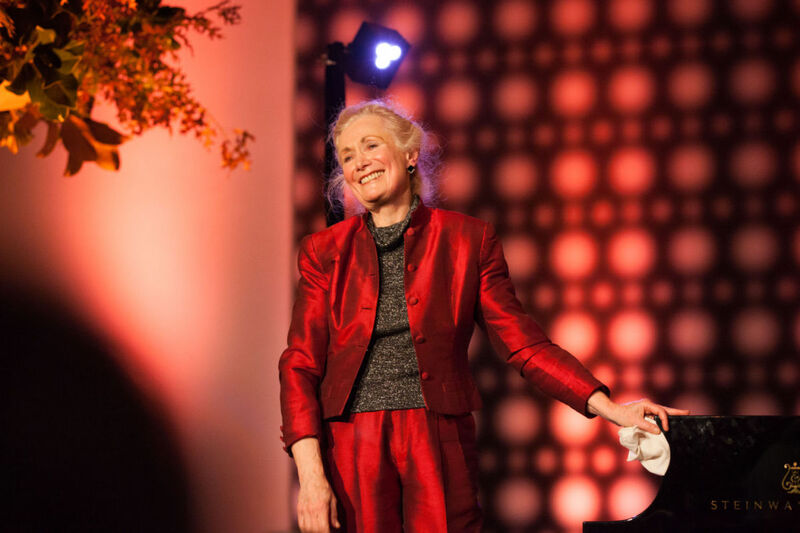 In 1998, she was invited to present recitals and master classes on Prokofiev by both the Moscow and St. Petersburg conservatories, and in 2015, she was the featured performer at the dedication of the Prokofiev Archive at Columbia University with members of the Prokofiev family in attendance. Some performing artists are particularly associated with one or two composers, and despite her broad range of repertoire, Barbara Nissman will always be thought of in terms of Prokofiev and Ginastera. Not only has she played their works publicly numerous times, she has also recorded them more than once! In October of 1990, she appeared with the Chicago Symphony for their first ever rendering of the Piano Concerto No. 1 by Ginastera. It was a busy time for her, but she kindly set aside a half-hour for this wide-ranging conversation . . . . . . . . .
Bruce Duffie: We’re talking about recording, so let’s just start right there. How do your ideas and approaches to the piano change when you’re on the concert platform as opposed to being in the recording studio? Barbara Nissman: First of all, I would say it’s much easier on the concert platform. In a live concert, you can’t go back and do it again. That’s probably the problem with recording — a luxury of being able to do it again, but yet the wish to make it just like a live performance. The idea is a live performance without the mistakes that one would hear when you play a performance over and over again. The slips just seem to jump out at you. For somebody like me, I’m not one to retake a measure or a passage. I have to do it within the context of the whole work. It drives my producers crazy, but luckily I have the stamina to do it. I want to do, say, three takes of a movement, and there’s usually one take that really catches fire, which you use as your basis. I find recording very difficult, and then I find the editing process even more difficult. But it is wonderful for me, in terms of my development, to really get me to focus on what I think I’m doing and what I hear myself doing. I found that with the Prokofiev, which was so huge. What a terrific learning process it was. But yet there is that danger of getting so involved that things do exaggerate in importance. Then when you hear the recording, you forget what it was that upset you so much. One strives for that performance, but then it always changes, and we don’t have the luxury of being able to record the same piece every few years to see how it’s developed. If recordings are done with the idea of live performance in mind, maybe that’s the best way when one has the time to do it that way. BD: Have you basically been pleased with your recordings that have come out? Nissman: Yes, with the Prokofiev I was very pleased. I worked with Tom Frost, and he captured the romantic-pianist sound that I wanted, that ‘round-sound’. I didn’t want that brittle, typical ‘Prokofian’ sound which I didn’t agree with completely. Then we have the two Ginastera CDs coming out, and in those recordings I think Ginastera would have been very pleased with the way the piano sounded. BD: We’ll come back to Ginastera in a little bit because I know he’s a particular favorite of yours, but let’s talk a little bit about the Prokofiev. You have recorded all of the sonatas and other pieces for solo piano? BD: Will you come back and pick them up sometime later? Nissman: I would love to, but it would really be an enormous project. [Laughs] Then I’d only be playing Prokofiev again. BD: Now that you’ve played all of these works, how does it change your idea of Prokofiev’s writing for piano? Nissman: I was always drawn to his writing. Even from my student days I felt that his solo piano music was his best, and that even accounts for his piano concertos, because this is his natural instrument. He is at one with the piano, and he takes more risks with the piano solo than he can possibly do with a piano in another medium. So by doing this project, it only reconfirmed what I felt all along — that he is a continuum of the Liszt tradition, and has not forgotten his nineteenth century roots — yet he’s built upon that with a personal language of his own. It’s uniquely his own, and he truly went his own way. I guess that’s really the problem the avant-garde camp has with Prokofiev, and also the conservative camp. He truly is his own man and doesn’t fit into any category. But what was interesting in doing this whole succession of sonatas is I’ve seen how the early ones built up to the three ‘War Sonatas’ (#6, #7, #8), and then of course the Ninth Sonata is the distillation of his style. There he returns to that childlike innocence. He comes full-circle, and he sheds all the peripheral things, and you have such a direct, lyrical, innocent statement. The Fifth Sonata is a magnificent work, but yet the ‘black sheep’ of all of them. I was amazed because until I started working on this project, I didn’t really know there was the earlier version, because most pianists, if they’re playing it, play the later version. When you go back to the earlier version, you see that he wasn’t happy with it either. This was the work that clearly, more than anything else, shows he was looking over his shoulder at Stravinsky, and it just didn’t work. There’s no way Prokofiev could have written the way Stravinsky wrote for the keyboard... and thank goodness! Luckily, he discarded that type of thought. It turned into a stylistic detour, and then he got over it and wrote those three War Sonatas. BD: Then why play and record the earlier version of something which was discarded? Nissman: Because it’s wonderful, especially with the way Newport recording has indexed it. It’s wonderful to see the things he changed, and clearly I prefer the first version. It’s interesting, because in my mind it’s more honest. What he tried to do in the second version was soften the hard edges because the first version is very angular, and jagged, and dissonant. It doesn’t really work, but by revising it, the second version doesn’t work either because he didn’t revise the original material. It’s just like an editor, trying to make a good poem out of a bad poem. BD: You’ve really got to scrap it completely and start over? Nissman: Yes, but it’s interesting as a real study of his works, to see exactly the passages he did develop, and what he discarded. You can do that with the indexing, and it’s clear. I’ve given two different interpretations to them. The first one I play more angularly than the second, and for the second I use a paraphrase of the first. BD: So they’re two different works? Nissman: In my mind they become two different works, two separate works. BD: You say the Ninth is a distillation of everything. What happens in the unfinished Tenth? Nissman: That is also included on the recording. When you hear the two-page fragment — and I got the second page since I made the recordings — you see that he was continuing what he did with the Ninth Sonata, and then you hear bits of the Classical Symphony as well. He was going back to an earlier style which was not so full-blown as the War Sonatas, but more lyrical. When one looks back at the end of one’s life, if one has the time, one is more mellow and can contemplate. BD: All of this piano music is comfortably on three CDs. Are they laid out the way you want, or are they simply in chronological order? Nissman: It’s funny because I toyed with the idea of grouping them because when I do the cycle, I do not do them chronologically. I do the cycle in three concerts where each program becomes so much of a different character, and it really works. I’m surprised myself that his music can hold up in three concerts, that you don’t get bored with yet another Prokofiev sonata. There’s such diversity, but with the recordings I thought it was important to hear them chronologically. And also, it just turned out best that way. The more I shuffled them about, the more I found they really worked the best chronologically. That way we could put three War Sonatas together on the second disc. It is important that they should not be divided. They are his three masterpieces, without a doubt. That’s the culmination of the piano writing. BD: If you’re doing three concerts, how do you arrange them? Nissman: It’s interesting, because the first concert in the series I wanted to be the most fireworks, but I wanted the contrast to be there. I chose the Visions Fugitives to open, which makes a wonderful opening. People are so surprised how wonderful they are because most of the time you don’t hear them complete. You just hear various ones as encores. Then I followed that by the wonderful virtuosic Op. 2 Etudes, which, unfortunately, I didn’t record. I need to do that. They are staggering, and every one has surprises. Then I end the first half with the Seventh Sonata, and follow that in the second half by the Eighth. I really wanted to include one large sonata in each program. It’s funny how that turned out. Then the second program includes more the unknown sonatas, the more lyrical ones — the Fourth, Second, First, Ninth, Tenth, and the Sarcasms, ending with the Toccata. That program has a character all of its own. Finally, for the third program I include the two versions of the Fifth Sonata. I tried to figure out a way I could program both together so that people would understand what we just discussed. I was capable of doing it, but it can be very confusing, and they are so similar. That was also my problem in performing these works. I could record them easily if I did them not back-to-back; one after the other they are so similar. So, for the concert I put the early version before the interval, then intermission, then the second version after the interval, and that worked. People could hear the difference, and it’s very interesting. I opened the program with the Third Sonata, which makes a wonderful opening, and closed the series with the Sixth Sonata. I was just amazed at how wonderful this music was to program because there’s a lot of Prokofiev going on. BD: When you play Prokofiev, now that you’ve recorded it, do you ever feel you are competing against your own recording? Nissman: I gave a recital at Aspen. They featured Prokofiev all year as their composer, along with Tchaikovsky, so I gave a Prokofiev piano recital. I really worked on the Ninth Sonata, and played it on the program. I thought it was too bad I couldn’t record it again because the whole interpretation really did change... and of course that’s the good part. Hopefully we always grow and get a little better. BD: Is this one of the things that sets Prokofiev on the highest level — the fact that you can never plumb the complete depths of his works? Nissman: Yes. This is the standard one has for all music, and that’s the reason I’m a performer... or else it would get pretty boring, wouldn’t it? Pianistically, Prokofiev always remains challenging, and that’s because of the high level of his craft and his pianism. I’m always amazed, when I’ve worked to discover his craft, how good he was with the form and structure and the motivic ideas. You never tire of that. For me, he’s the one for piano in the twentieth century, for sure. He is so completely satisfying, and also emotionally so satisfying. I’m a selfish performer, but I have to have that gratification and that kind of fun of doing it. I found this with reworking the Ninth Sonata. I really was amazed how wonderful it is to put something away, especially recordings. We have done them, and then people talk about them, and you don’t have do the work anymore! [Laughs] It’s a different feeling when you’re taking it out for a live performance, and reworking it, because the nitty-gritty work has already been done, and it’s a different kind of reworking for a performance. BD: Are there some works that you’ve done where you feel you’ve gotten everything out of them, and you really don’t want to come back to them? Nissman: Yes, of course, there are, and it’s because they are not at the genius level. BD: But is there a place on the concert platform, or even in the recording studio, for these works? Nissman: Definitely, especially now in the age of the CD, when one can record complete works. My feeling is that since you have a longer CD, and there’s a composer that you’ve really delved into, why not just do the complete output? It’s much more interesting for the collector. If people don’t want to listen to it complete, they don’t have to. There have been composers who are terrific in their context, even if it’s just as a virtuosic show piece, to play the hell out of it for what it’s worth as a crowd-pleaser. But there are certain standards, and you don’t play stuff that isn’t really up to a certain level, that you can’t believe in. But not every composer’s Prokofiev, and certainly none is Beethoven, but that doesn’t mean we only play Beethoven. BD: You mentioned the audience. How much do you get involved in the reaction or the expectation of the audience when you’re programming, or even playing the concert? Nissman: Perhaps I should think of them more. Somebody talked about doing a recital program as if it were a recipe. You just can’t do certain works back-to-back because you, yourself, as performer, can’t do only heavy things in terms of your own concentration. But I do think about what kind of program I would like to do as a serious pianist. If I were listening to a colleague or a young pianist for the first time, it changes because at first I would want to hear them in a variety of repertoire. Yet certain composers work well alone, like an all-Beethoven recital or an all-Prokofiev recital. All Ginastera, oh, no! For sure not! You could use one work on a recital program that probably would be the crowd-pleaser. But those kinds of programs always keep changing for me. It’s funny... you get ideas, and you can’t wait to do then. I can’t wait to do a Liszt/Prokofiev program, for example. I have to do a Prokofiev/Mozart program because of the anniversary. I’ve been asked to do that in Germany, and I never would have thought to put Prokofiev with Mozart, but oddly enough it does work for the program I’ve come up with. BD: I wonder if there’ll be anything strange because it’s Mozart’s death  and Prokofiev’s birth . BD: With this huge array of repertoire — you have the whole history of pianism — how do you decide which works you’re going to work on, and which works you’re going to leave for others to explore? Nissman: It’s the things I really love to do and have wanted to do. I did do a Liszt recording earlier, and I kept saying that I’ve got to program the Liszt Sonata. I kept putting it off, and then finally I said I would do it now, and then in ten years’ time I’ll do it again, and then I’ll do it again, and by the time I’m sixty I’ll really be able to enjoy it. [Laughs] That’s the kind of work that keeps evolving. What it boils down to is the composers who are very special are the ones who loved the piano and wrote so well for it. By saying that, you include the whole nineteenth century. I think of Prokofiev as really an extension to that, and Rachmaninov, of course, and Brahms and Liszt and Schumann, and maybe throw in a little Franck, and Chopin of course. It’s exciting, and this is the need for me. BD: Will you play the Mozart on the standard piano? Nissman: Oh, yes. I’m a nineteenth century pianist, and that means a terrific Steinway — although it’ll be a German Steinway rather than an American Steinway. I really like my Mozart that way. BD: Every time you go to a new concert hall, you invariably run into a new piano. How long does it take you to get used to the joys and sorrows of each instrument? Nissman: It takes usually longer than you have. [Laughs] It really does, and that’s a problem when people don’t take into account or understand that you’re exchanging your best friend for a stranger. It depends on the piano that’s given to you. Thank goodness with major symphonies in Europe and in the United States, the level of the instruments you’re given to choose from is very high. You might complain that the bass could be a little more boomy, or the top could be a little bright, but usually there’s somebody there to make it presentable. To get used to it, though, takes me at least... [thinks a moment] a day isn’t even long enough, but definitely a few hours before the concert. BD: Do you really have to make friends with this instrument? Nissman: Yes, you do. You have to experiment with it, look for the colors, and also the way the piano physically feels under your fingers. There are some pianos that no matter what you do, you can’t make it feel warm, and you can’t warm up to it. It’s just the physical sensations, the certain resistance in the keys. You run into those occasionally. For instance, if they put new hammers on just before you arrive, and you have to play Prokofiev Third — which has happened to me — there’s nothing you could possibly do to remedy what’s going to happen. You can’t force the instrument. There’s no way one could produce a bigger sound. BD: Once you get used to the instrument, do you adjust at all for the hall that it’s in? BD: Let me ask the great big philosophical question. What’s the purpose of music? Nissman: In our society now we need it probably more than ever before. The purpose is to communicate, to touch those places where daily life never goes. With more complexities and more problems that our society has, music can give pleasure and joy. I do it because I need to do it. I need to play the piano, and I acknowledge that need. I really love to play it, and I love making music, and I’m in love with the music. From the audience’s standpoint, I would hope that people would do it for their heart. I don’t think that’s the case all the time, but I would hope it would give enjoyment. BD: Do you play differently when the audience is there for festival situations and that’s their whole reason for attending, as opposed to subscription concerts where they come after beating their brains out all day at work? Nissman: Oh, no. To take that even further, I don’t play differently at any kind of event. As a performer, I really feel a responsibility not to the audience so much, but to Beethoven or Prokofiev or whomever, and to me. There’s really that challenge of wanting to get as close as you can to what you envision in the music. Maybe it’s just feeling that direct communication, or that feeling there aren’t any barriers. You’re always working with that. You’re always fighting your own self in terms of your concentration, and hoping there’ll be that free-flow. That’s what it’s really all about. It’s the addiction of doing it. It’s always different, and it doesn’t get easier. There’s no formula for it. The only odd thing is the outdoor concerts that make it difficult when you can’t feel the focus of the sound, or when the airplanes are going overhead. [Laughs] But within that context, one adjusts because that’s the context in which the music is being made. BD: Let’s come back to your other passion — Ginastera. Tell me a little bit about him. Nissman: I met him when I was a student way back in 1971. He came for the first contemporary music festival at the University of Michigan. That was the first performance I was giving of his Piano Concerto with the University orchestra. That’s really the basis of our friendship. I had studied his Piano Sonata, as every piano student in most universities does, because it’s now become standard twentieth-century repertoire. It’s very well written, and out of all the piano sonatas, it really is probably his masterpiece. I played the Sonata for him before I was going off to Europe to start my first European tour, and to make my debuts in the European season. I included that on the program, and he was always so gracious. He liked the performances, and then several years later I received a call when I was based in Holland. It was his sixtieth birthday, and the Suisse Romande was going to give a gala birthday concert, and he wanted me to do the Piano Concerto, which was terrific. Since that time, I’ve performed it many, many times, and at that time he also made me a promise to write me a piano concerto, which, unfortunately because of his ill-health at the end of his life, and because he was always late with commissions, became the Third Piano Sonata — a very short one — which turned out to be the last piece he ever wrote. We spoke about it a little bit, but that’s the way we did the editing — by transatlantic telephone! BD: Did he hear you play it? Nissman: No, he never heard me play it, unfortunately, but he heard me play a lot of his music. I made a very early recording in Holland — my first recording for CBS — of the complete works of Ginastera, which of course doesn’t include his later works. He bought up a lot of copies of those, and I was very complimented that he gave them out to all his friends. BD: What is the work that you’re playing here in Chicago? BD: How do you divide your time now between solo recitals and orchestral appearances? Nissman: I don’t know what the balance is. I think I’m doing more solo recitals, but it used to be more concertos. So I guess it is fifty-fifty now. BD: [Mildly Shocked] Really??? Fighting with the piano??? Nissman: Before the concert, yes, in terms of trying to make peace with it. Many times I wish I had what I have at home. There are always compromises one makes. It’s terrible to say that because I don’t bring my own instrument, but the pianist makes the compromises. You adjust, and actually that’s the challenge. You search for your colors, and you get a different instrument, a different palette all the time. Then with an orchestra it’s a different kind of work. What’s nice is when you’ve worked with a conductor whom you’ve worked with before, and it’s a renewed collaboration, and you think through pieces the same way. It’s a real joy. BD: Is it ever too much work? Nissman: No, not at all. I can’t get enough. Nissman: For me it is. That’s why I said I have the need to play, but I love playing the piano. If it weren’t fun, I don’t think I’d do it. I like practicing, too. I enjoy the whole process of the working through each piece, though some pieces of the modern repertory one enjoys more or less. BD: If a composer says he’s writing a piano work for you, what advice do you have? 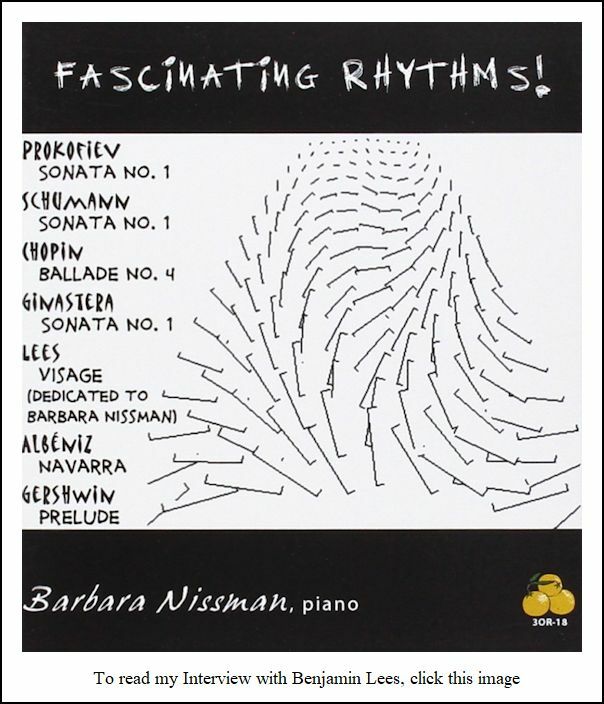 Nissman: In the twentieth-century, my biggest concern has been making it pianistic, and well-written for the piano. Although I would say not to abuse the instrument, I would want them to expand and exploit it. Secretly I would want it to go beyond Prokofiev, and that’s hard to ask of a composer, unless he’s a terrific pianist. To really know the instrument and take it from there, that’s what I would want. Also, I would hope that it would have a formal structure, and that it has something valid to say that I would like to play. BD: What is it that makes it valid? Nissman: The criteria that comes first to mind is something you picked up on earlier, namely something that wears well. I would want something that, no matter how many times you play it, or rework it, or an audience hears it, there has to be a reason why it comes back and we want to hear the work again. For example, if it’s just different sound-effects, when you’ve heard it once you’ve heard it, and there’s no reason to hear it again. It has to be strong within a form and a structure. Ginastera put it very well when he used to say that a transcendental thought was worth repeating. That’s why he would want a classical structure — not that he would repeat it in the exact same way, but if he had something worth repeating, then why not repeat it? It has to be worth spending all that time on. One’s instinct knows a well-crafted work, as does the audience. They recognize it, and hope for another Bartók or another Prokofiev. BD: Do you do some teaching? Nissman: No, I just perform, but occasionally, when I do a solo recital, I’m called upon to give a guest masterclass, which I like doing. BD: What advice do you have for the next generation of pianists? Nissman: [Thinks a moment] Besides working with as much depth as possible, and uncovering the structure and discovering how the work is put together, one would hope that the personality would really be free enough to develop and grow into an interesting personality and an interesting performer with something to say. There has to be a reason an audience comes to concert — other than hearing the same pieces over and over again. That’s the performer’s function, the reason why you come to hear different interpretations by different artists. One works and one tries to improve one’s concentration, and, to quote Balzac, “Time is the best gift an artist can have.” This means time to really work and to develop in seriousness. BD: Thank you for taking the time to be a pianist! This conversation was recorded in Chicago on October 12, 1990. Portions were broadcast on WNIB a couple of weeks later, and again in 1994 and 2000. This transcription was made in 2017, and posted on this website at that time. My thanks to British soprano Una Barry for her help in preparing this website presentation.